At the age of 16, Robert Doisneau became an amateur photographer. The only problem was that Doisneau was so shy that his beginning work was mostly photographs of cobblestones. Eventually, he built up the courage to start photographing children, and from there he learned to photograph adults. His shyness wasn’t necessarily an obstacle, but rather his future signature style. Doisneau “presented a charming vision of human frailty and life as a series of quiet, incongruous moments.” He once said, “The marvels of daily life are so exciting; no movie director can arrange the unexpected that you find in the street.” As it turned out, in the cobblestone streets of Paris is where Doisneau found fame. The photographer was contracted by Vogue as a fashion photographer, but Doisneau didn’t like it very much. Photographing gorgeous models in over-the-top settings wasn’t what he was interested in. He wanted to photograph real life, to capture the everyday moments in the streets. Every chance he had, Doisneau would escape his studio at Vogue and take his camera around Paris, looking for those quiet, incongruous moments. In 1950, just two years after he was contracted by Vogue, Doisneau was asked by Life to get pictures of romantic couples in Paris. They had seen some of his touching images of everyday life and decided to recruit him for an upcoming project. The magazine was working on a sentimental story, much like many others they did at that time. So Doisneau gladly set out with his Rolleiflex, found a seat at Le Villars (a little sidewalk café just across the street from René Simon’s acting school), and waited to see what he knew would inevitably appear in the streets of Paris – a young couple kissing. The picture was published in Life on June 12, 1950 without any reference to the identity of the couple. They continued on with their lives without instant fame. The only souvenir, of sorts, was an original print Doisneau signed and gave to Delbart as payment for her “work.” Only nine months after the picture was taken, Delbart and Carteaud broke it off. Delbart continued her passion of acting, appearing in a handful of somewhat-successful films. She happily married Alain Bornet, who was a documentary and promotional filmmaker. After her marriage, she traded her career of acting for working in the business aspect of film. Carteaud, on the other hand, gave up on acting completely and became a winegrower in southern France. Apparently, that was the wrong thing to do. The Lavergnes took Doisneau to court and attempted to sue him for “taking their picture without their knowledge.” (In France, among other countries, they would own the rights to their own likenesses.) This forced Doisneau to admit that the photo was posed. He explained that he had seen Delbart and Carteaud kissing, but that his natural reserve prevented him from photographing them in that moment. “I would never have dared to photograph people like that,” Doisneau said. 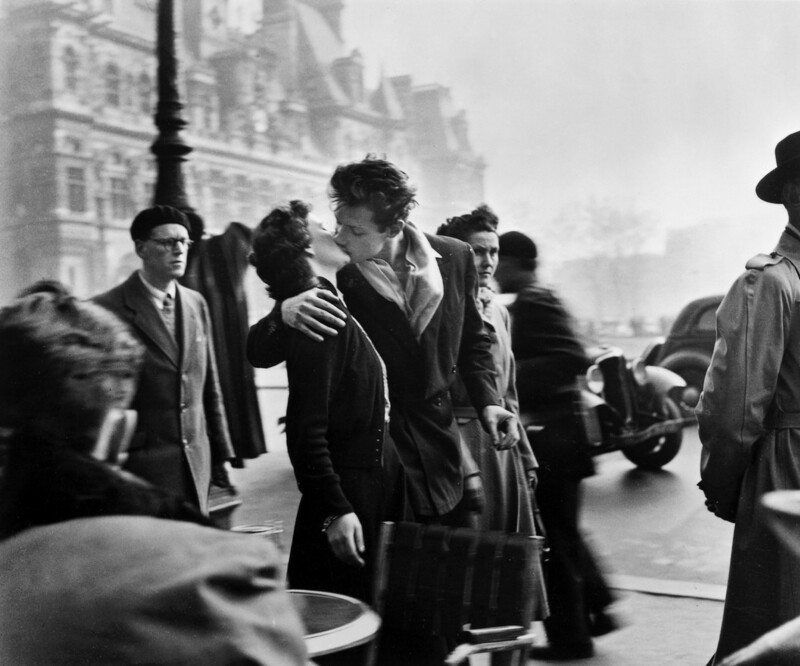 “Lovers kissing in the street – those couples are rarely legitimate.” Doisneau won the court case against the Lavergnes. 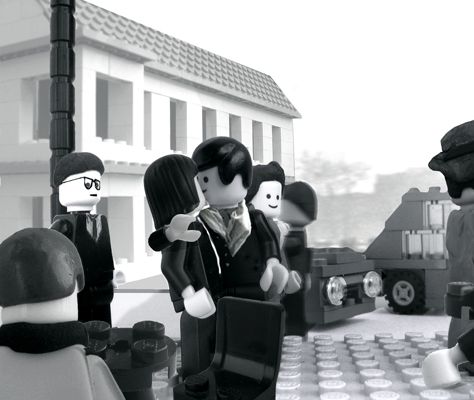 It was then, in 1992, that the identity of the couple was revealed to the public. In 2005, 55 years after the photo was given to her, Delbart (now Bornet) auctioned off Doisneau’s print. She had expected to receive somewhere around $10,000. The print sold for €155,000, or roughly $242,000, to a Swiss collector. She used the money to start a film production company with her husband. But for real, who makes these?? That’s a really beautiful picture. I’ve always found it funny to see people try to stage candid pictures and absolutely fail and have them come out looking artificial and just plain stupid. But Doisneau was able to make a candid out of something staged, which I find impressive. The couple looks absolutely to be kissing just for each other and ignoring the camera entirely. I was a little disappointed that a love story did not pan out from the two of them (that would have been so romantic). Great job though! Really liking the French! Your European history stories are quite fun to read!